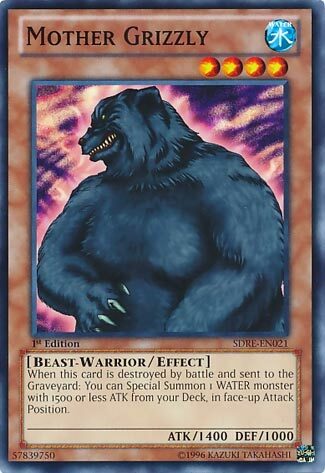 When this card is destroyed by battle and sent to the Graveyard: You can Special Summon 1 WATER monster with 1500 or less ATK from your Deck, in face-up Attack Position. Mother Grizzly wraps up Mother’s Day week, and here’s to hoping everyone’s Mother’s Day is filled with smiles and memories. A WATER searcher that has been around for quite some time, but as the years have gone on, there have been better searchers and Attribute search cards that outplay this card. It was handy, as with all the searchers like Mother Grizzly, to run through all three copies and get a search at the end. Mermail and Atlantians can search out their own cards easier, but Mother Grizzly can be useful in Gishki, Cloudians, and Ice Barriers, all non-meta decks. The best WATER monsters typically have higher than 1500ATK and others work better in sync with their own specific support. Mother Grizzly finally justifies the name mother. She’s a Level 4 Water Beast-type monster with 1400 Atk and 1000 Def. If she is destroyed by battle and sent to the grave she gets to Special Summon a Water monster from the deck in Atk position with 1500 or less Atk. Yeah, she can thin the deck, but more importantly, she’s a bear that can Special Summon Fish. For her babies. Really though, destroyed and sent to the grave by battle is terrible these days. Mother Grizzly is arguably the best card this week. Hopefully Mother’s Day goes much better. We end the week off with one of the first six floaters in the game, Mother Grizzly. Mother Grizzly is a Level 4 WATER Beast-Warrior with 1400 ATK and 1000 DEF. Weak stats for a Level 4. Beast-Warrior is a great type and WATER is a great attribute. When Mother Grizzly is destroyed in battle, you can summon any WATER monster with 1500 or less ATK from your deck in Attack Position. Honestly, back in the day this could of been considered as solid floating, but now it is just power crept out of relevance. Sure it can float into other copies of itself, but only when destroyed in battle. Not only that, but the monster you summon has to be in Attack Position, and 1500 ATK or less will be easy to kill, so you are likely taking damage. Decks now-a-days are fast enough to where they won’t need any of the old attribute floaters, leaving Mother Grizzly left in the past. Art: 3/5 Mean looking bear. Mother Grizzly, if I recall, was one of our first Monsters in the “destroy me and get a Monster of the element with 1500 or less attack”. For a long time, there weren’t many Monsters in this criteria that were worth retrieving. There certainly are now, and in the speed area of Yugioh we’re in, the Monsters we have that do this are pretty irrelevant. Mother Grizzly just suffered from bad distribution and timing of cards that were worthwhile to be fetched via her effect. This is a bit of an unfortunate card. During the early years of the game, there were very few good <1500 ATK WATER monsters. But as better <1500 ATK WATER monsters emerged, monster removal became more plentiful and Grizzly was no longer a reliable way to search out WATER monsters.